It’s amazing how often I meet people who have lived in Hiroshima all their lives who have never visited Mitaki-dera Temple. It’s one of Hiroshima’s hidden gems, particularly beautiful in autumn, but a place to which one can return time after time whenever in need of a bit of peace and quiet in beautiful surroundings. The Shingon Buddhist temple dates back to 809, and is located in a steep, heavily forested valley on the side of Mt Mitaki-yama and takes its name from the three waterfalls within its grounds. It is most well-known, perhaps, for the Tahōtō two-storied pagoda, said to date back to the Muromachi period (1392-1573), relocated from a shrine in Wakayama Prefecture in 1951; a donation to help assuage the souls of those lost in the A-bombing. The pagoda is designated as an Prefectural Important Cultural Property and the wooden Amitabha Buddha inside a National Important Cultural Property. The real charm of Mitaki, however, is in its atmosphere. 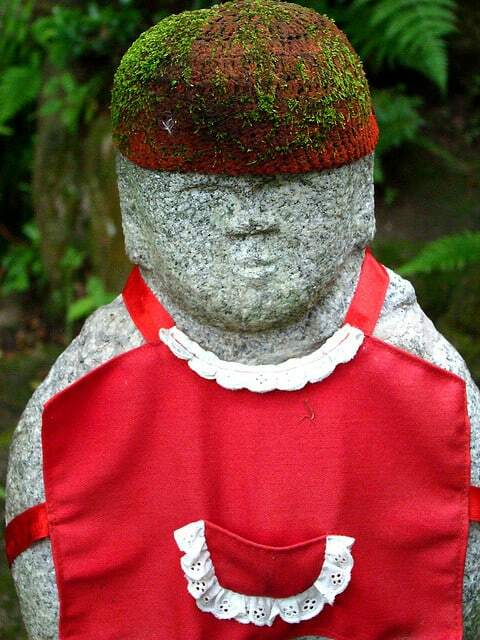 As you make your way through the temple complex, up the moss-covered stone steps, you pass hundreds of buddhist images and jizō statues in their bright red caps and bibs, each with its own unique countenance and expression. As you might expect in a place named after its waterfalls, this place is very green, and as you get closer to the far reaches of the grounds the trees become more and more magnificent. The place feels almost enchanted. All the stone, moss and streams means that Mitaki is a beautiful place to visit even in the rain. In fact, I highly recommend going on a rainy day, as it’s unlikely that you will find many other people there. The approach to the temple, up the road that runs from the train station to the temple entrance is lined with cherry trees, and the park (not much more than a dirt play area) below is a popular hanami spot during the cherry blossom viewing season. It is in autumn, however, that Mitaki really comes into its own. The leaves positively blaze red and photographers burn through many many gigabytes during November kouyou autumn leaf-viewing season. The mountain on which the temple sits is known variously as Mitaki-yama, Uematsu-yama and Soko-yama. The latter two names come from the fact that the samurai tea master responsible for the design of Shukkei-en Garden in central Hiroshima, Ueda Soko, planted a pine tree on the summit to enhance the natural backdrop of his garden and tea houses. The hiking trail over the mountain is a popular one and is accessible all year round. The trail (marked “Course B”) starts from just inside the temple gate and immediately after passing the Tahōtō pagoda. It’s a fairly steep climb of about 1100m to the 356m high summit, but the views are worth it. The trail to the left (with the city view behind you) takes you along the ridge and drops you at the top end of the temple complex after a bewitching descent through a beautiful bamboo forest. There is also a charming rustic tea house called Kūten-an within the temple grounds which has tables inside and outside and serves simple Japanese food and some delicious Japanese desserts. The entrance to Mitaki Temple is about a 20 minute walk up a steep road from Mitaki JR Station two stops from Hiroshima Station on the Kabe Line. With the station behind you, head to your left and turn right crossing the level crossing. Take the right fork at Saigan-ji Temple and follow the road around to the left, passing a children’s park on the right hand side. I totaly agree with the entire text. I have also spoken to many people from HIroshima who hadn’t even heard of the place. It is wonderfull place with beautiful views and sights. In 3 months time I’ve gone there 5 times because it’s the most peacefull and relaxing place of Hiroshima. mitaki is always amazing – spring with cherry blossoms, summer cool, especially stunning in autumn and winter with the deep blue skies. I am an American who lived in Hiroshima for six years. Mitaki will always be one of my favorite places. I especially loved hiking above the shrine and through the amazing bamboo forest. I also enjoyed the small tea house where they served delicious food. Don’t miss it! Is it possible to take a short taxi ride from the JR station to the temple? If so, how much would it cost? A taxi from Mitaki JR Station should cost just under ¥700 (the staring taxi fare), but it is a small station so there may not be any taxis waiting in front. An alternative is to take a taxi from Yokogawa Station which should cost around ¥1000 for the 10 minute ride. Enjoy your visit to Miytaki Temple. It’s one of our favorite places in Hiroshima and we’d love to hear your impressions. I’m travelling with my parents and my children. Can we drive to the temple instead of hiking? There are a few parking spaces at the entrance to the temple. You should be ok on weekdays but it can get busy on weekends (especially Sundays). The final stop of the number 22 bus route (from Hiroshima Station and in front of A-bomb Dome) terminates at Mitaki Kannon (三滝観音) which is 200-300m meters from the entrance and runs about once an hour. What is it like in mid December? I’ll be in Hiroshima then and would like to give this place a go! The red leaves will be mostly gone, but the grtounds of Mitaki Temple are beautiful at any time of the year!